My Google Fu never was up to snuff, and I'm sliding as the years wear on. I need to rebuild the pump head on a Zefal HPX4. where does one find such parts? but try xxcycle.com in France, they had complete rebuild kits and spare heads up to a few years ago. Last edited by unworthy1; 05-31-15 at 11:51 AM. Maybe simpler to buy a new pump, although that sort of thinking typically goes cross-grain for me. I recently had an issue with one of these, and taking a couple others apart in the process, I found at least 3 different configs of the inerds. It appeared, though I can't state unequivocally, that the head shell itself was the same in all cases. So if you find a complete set of the inner works, it should fit, but slipping in one part might not. at a glance: yes it probably will. Many of these Zefal pumps shared many parts...but not all or always. 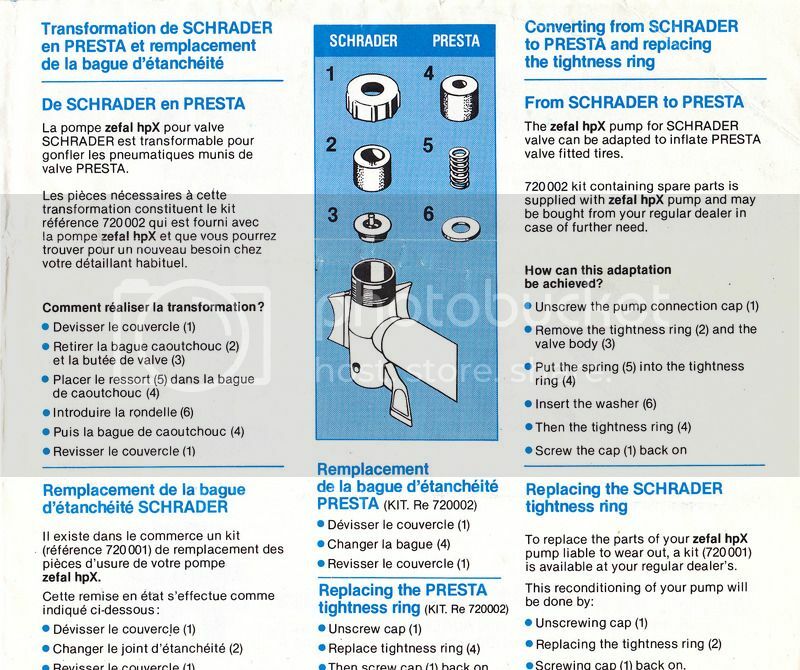 If you're talking circa 1980s-1990s pumps, this is the pump manual page for switching a Zefal HPx between Schrader or Presta valves. The parts are also the same as the Zefal HP. Thanks. I have a HP, that I bought here, and I think I can still buy them here. I might just go that route, If I can still find one. Owning a couple of Silca's prevented me from knowing this could be a problem! Assuming you are using it for presta, it would be great if you could report back. Do we think the parts that come in that kit are the entirety of what's going into the pump head, ie. not re-using any other parts? We'll see. I would guess we are re-using other parts. It's been awhile since I've had it open. I'll pull apart my HP first, to compare. Only presta for me; I finally gave up on schrader tubes. I don't buy them anymore anyway. Update: I made a trip over to the Mayan Riviera yesterday, to meet up with Fb in NY, and pick up the pump parts he brought down for me. This one: Zefal Replacement HPX-73 Rebuild Kit worked well for the re-build of my HPX 4, bought new in 1996. I only needed the part that grabs the presta valve though. I couldn't get the cap that came with it to thread on, as if it was a hair too big, though I can't imagine this being the case.